Transmits color video signal up to 5,000ft (1.5km) using an active balun transmitter and 3,940ft (1.2km) using a passive balun. Active receiver hub with adjustable contrast and brightness. Active operation amplifies the video signal for excellent picture quality at long distances. Compact 1U height fits most standard 19" equipment racks. 16 Video inputs (terminal block). 32 Video outputs (2 per channel, BNC connectors). 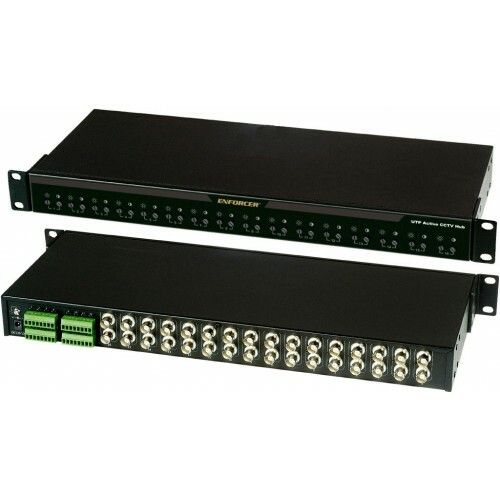 Feeds camera signals to any standard video multiplexer, switcher, or DVR via coax cables. High immunity from interference — Built-in impedance-coupled device and noise filter. Built-in video surge protection and ground loop isolation. Status LEDs indicate video signal for each channel. Easy installation with removable terminal blocks. Rack mount or stackable. Allows for rack, wall, desk, or shelf mounting. Other optional mounting brackets available. Power input: Dual voltage - 12/24 VDC/VDC. 1.5 Amp 12VDC power adapter included. Perfect for use with DVRs.